Baked Quince; Dessert or Side Dish? This is the calm before the storm. Cold, but not too cold. There is still time to brace ourselves for the inevitable. Some of you can’t wait for it to snow, snow, snow so you can ski, ski, ski. The beauty of the winter season is unquestionable, but the burden of coping with the cold, snow, ice and slush…makes me want to hibernate. 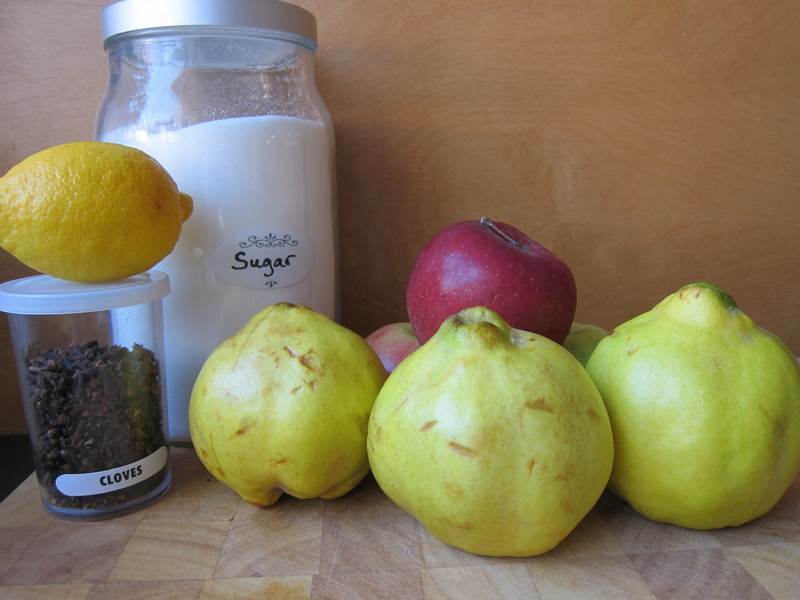 Having never cooked nor tasted a quince, I threw several into my shopping cart hoping to find a suitable recipe. In no time at all, a blog was located, In Praise of Sardines, inspiring this quince recipe. 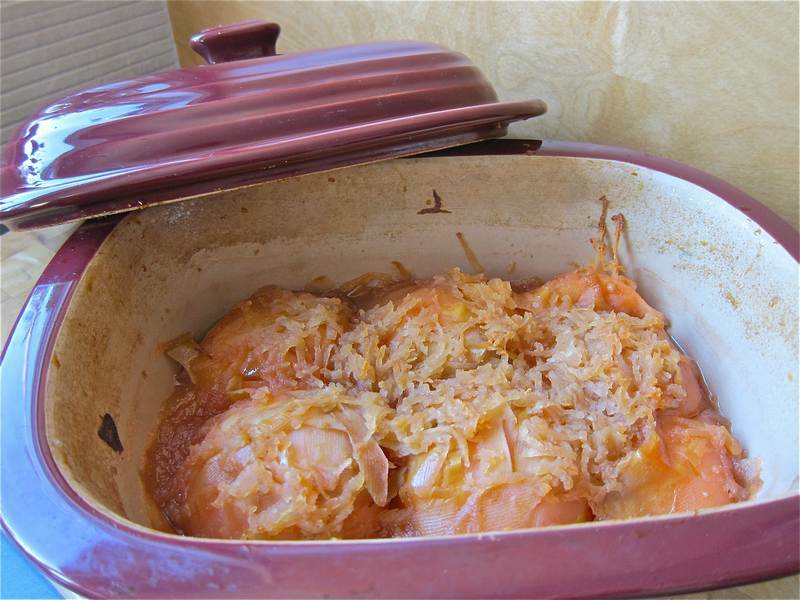 The original of this baked quince recipe is from Paula Wolfert’s “The Slow Mediterranean Kitchen”. You can make superfine sugar by processing regular sugar into a food processor or Magic Bullet. You can also substitute your preferred sweetener. Preheat oven to 300 degrees. Peel and halve the quince, saving the peel. 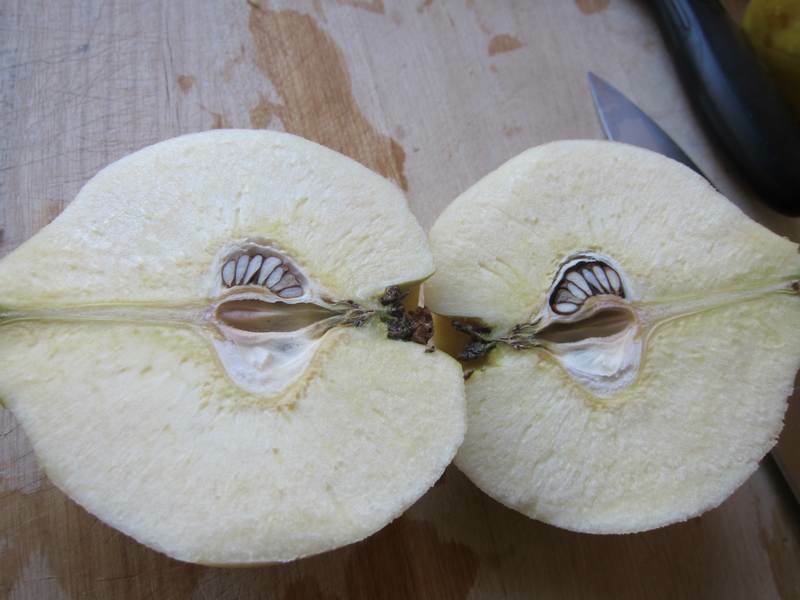 Use a small paring knife to carefully core the quince. Combine the sugar, water, clove, and lemon juice in a covered casserole. 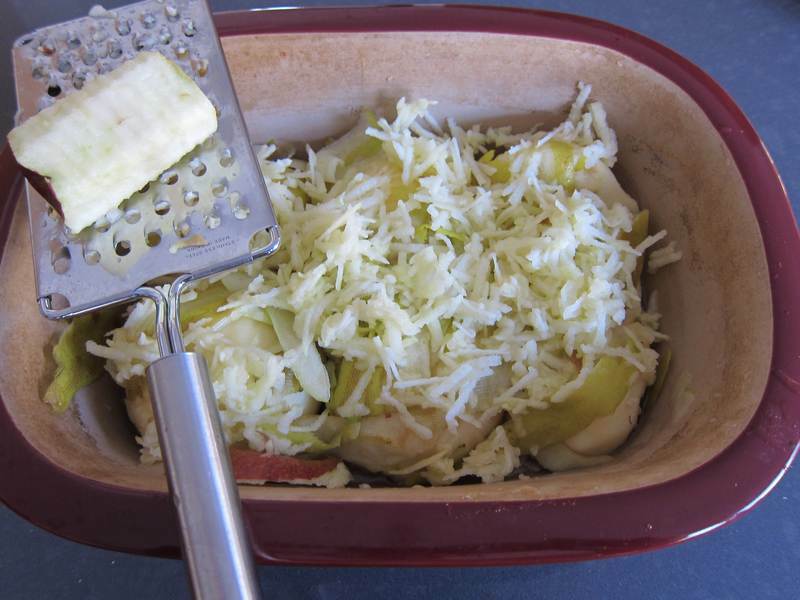 Stir with a whisk until blended then add the quince, cut side down, covering it with its peel and the grated apple. Bake covered for 2 hours, or until the fruit softens and turns pink. Baked Quince Dessert: Plate the sliced quince, placing a spoonful of thick yogourt or vanilla ice cream on the side, or piping yogourt on top. Pretty, tasty and exotic. 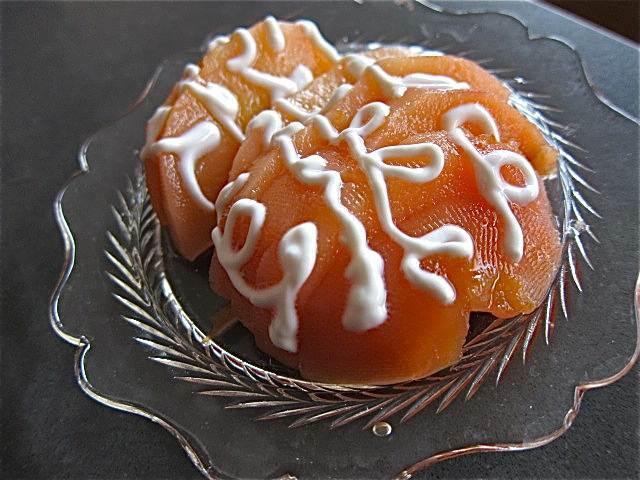 Quince Side Dish: Serve sliced quince along with meat, chicken or fish to add some sweetness. Quince Syrup: Strain the excess baking syrup and add it to alcohol, regular beverages, or any main dish that requires a little sweetness. Pampered Chef Jittery Cook Event: There are still a few spots open for the get together, Sunday, December 11, 2011 at 1:30-3:30. Email me, [email protected], if you would like to attend, or if you would like to order Pampered Chef kitchen tools. All items ordered will be received before the holidays. The lovely covered casserole used for the Baked Quince is a Pampered Chef Deep Covered Baker. what does it actually taste like? It looks like pear kind of. is it mushy? It is similar to pear with a lovely aroma. Your blog is looking better and better each time. I’ve never actually had a fresh quince but my father used to sell quince jam in his butcher shop. The jam was imported from Switzerland I think. I had it often as a child and loved it. I love love love quince, it’s the texture that is so great. I make a wonderful quince jam/preserve that is lovely on ice cream or straight up on a spoon! !